Photo Highlight of the Week: Cameron and Sydney showing off their treasure maps! Students had fun practicing measurement and interpreting scales in this project! Next week is testing week! Students may arrive at 8:15 a.m. each day to assure extra rest and/or a good breakfast. Testing will begin promptly at 8:30 a.m. However, if you need to drop your child off at our regular start time due to work schedules, you may still do so. We will test Monday through Friday from about 8:30-11:00 a.m. Please plan all appointments accordingly. Thank you in advance for helping your child be present and ready to shine on those days! Parent volunteers have signed up to send in snacks for each day. However, if your child would prefer to bring their own snack, they may. Our rooms tend to be a bit cooler with all those still bodies, so sending in a light sweater or sweatshirt is a great idea! Our Tiger Rising discussion will take place on Monday after testing. Students will receive the Week 4 assignment that same day. They will have a couple of opportunities to work on it after testing throughout the week. On Friday, students will get a sneak peak of our new history unit by watching an “All About the Renaissance” video! 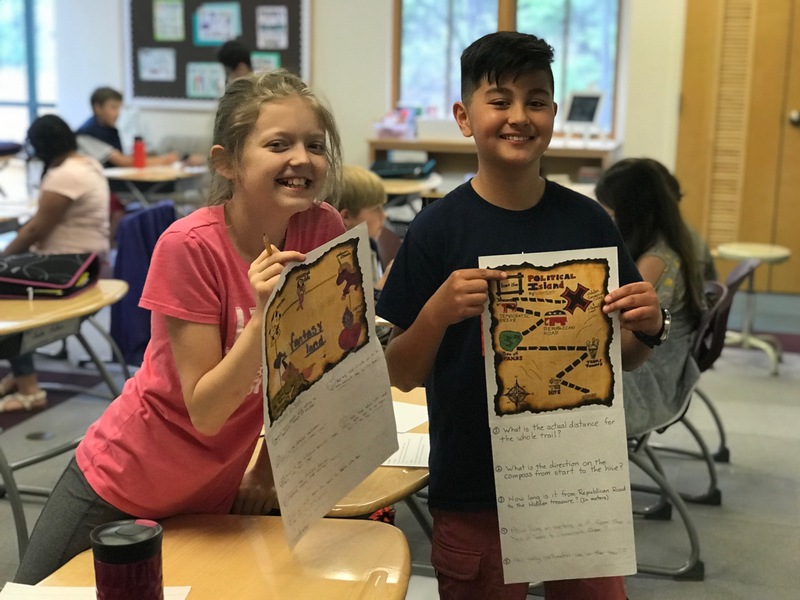 Last week, students enjoyed our measurement scavenger hunt and using their knowledge of measurement and interpreting scales to create their very own treasure maps! After testing week, we will be able to put our maps on display for others to see, so come by and check them out! On Friday, we learned about different types of transformations, including reflection, translation, and rotation. Then, we studied familiar logos to see how transformations are used in the design. Students were challenged to find three real-world examples of transformations this weekend to share on Monday. They can print a picture or even draw an example of what they find.